I’m posting this a little later than usual, but better late than never because it’s a great chocolate chip cookie recipe. Plus it’s kind of different. These are cookies with pudding mix! Actually, they are cookies with pudding mix and oatmeal. There’s a popular pudding mix added cookie recipe on allrecipes.com which is great, but on the soft and cakey side. This version is not cakey at all. It’s soft with crispy edges and a slightly nutty taste from the oats. If you like adding a lot of different things to your cookies, feel free to add a dash of cinnamon and/or nutmeg. The version below is pretty traditional. Update: This recipe has become one of my favorites. The shortening gives them a bakery-like texture, but you can use butter if you prefer. I like to make the dough, scoop it with a medium cookie scoop, chill the balls of dough, then freeze them and bake as needed. Preheat oven to 375 degrees F. Line a couple of cookie sheets with parchment. Whisk flour, baking soda and salt together in a bowl. Set aside. Cream the butter, shortening and both sugars with an electric mixer, scraping sides of bowl often. Beat in the vanilla pudding. When well mixed, add the vanilla and eggs and beat until eggs are mixed in. Add the flour mixture to the batter and stir until it is almost fully mixed in. Add oats and continue stirring until flour disappears. Stir in chocolate chips. Drop batter by (heaping!) tablespoons, spacing about 2 ½ inches apart, onto the parchment lined cookie sheets. Bake cookies for 12 minutes or until edges are brown and tops appear set. Let cool on sheets for about 5 minutes, then transfer to a wire rack to continue cooling. You can use heaping teaspoons and get about 60 cookies (bake time will be shorter), but I've made these several times since first posting and prefer using heaping tablespoons. Heaping tablespoons will give you about 32 to 35 cookies. These are different than other chocolate chip cookies with pudding mix, so if you try the recipe let me know what you think! Wow, pistachio sounds great right now! Thanks for the idea. I wanted to give pudding cookies another try after finding other recipes too cakey and found your blog. I used pistachio pudding and added 1/2 teaspoon of almond extract and they came out perfect. The pistachio is not too strong and adds a wonderful twist. The texture was exactly what I was looking for. Thank you for this super yummy recipe! I was looking for a pudding cookie recipe and came across your blog from a Google search. Just finished taking the last tray out of the oven and I already know I should have made a double-batch! These are delish. Just the right combo of crispy edges and soft centers with a perfect salty-sweet taste. I used salted butter and only one cup of mini semi-sweet chocolate chips. I have been browsing your blog for a couple of months now, but this is the first recipe that i have tried, i just finished baking them and they are very yummy. I made a double batch as i end up giving away alot of my baking. I only had one box of instant vanilla pudding mix and several boxes of chocolate , so i added a box of the chocolate, and they turned out great, just more chocolaty! Thank you so much for the great recipes! I didn’t realize there was such thing as a Cookie Ministry. That is great! I am going to go read more about it. These are soft, but not super-soft or cakey. I think people would like them, though…..and be able to eat them. I’m going to bake these cookies this weekend for the Mobile Loaves and Fishes (MLF) Charity here in Austin. MLF goes out in catering trucks every night to feed the homeless. I’m part of the Cookie Ministry that provides homemade cookies as part of the nightly meal. We have to make soft cookies since many of the people have dental issues. These sound perfect! Just finished making these and mmm are they good!! I cooked them for 11 mins at 350 and they turned out perfectly!!! I also used only margarine instead of shortening and margarine as I don’t have that in the house. I made this this weekend, and got rave reviews from everyone. I loved the texture and flavor, and they looked very attractive, too. Thanks for the unique recipe – I never would have thought about adding pudding mix to cookies. Oh, did you like them still today, Anna? Also–sounds like you got a dog. We’re anxious to hear (and see) all about it. Made these today. They are pretty good! Mine look pretty much just like your picture. I didn’t do anything different except used unbleached all purpose flour. Good CCC, not my favorite, but decent. Puddin’ on the ritz cookies! It is quite the cute addition – good choice for a name too! Jeff thought about looking for a new pup right away, but I think he wants to wait a bit after what we just went through. Max has been very quiet and reserved… so we think we probably won’t wait too long so he has a playmate again. Joe, indeed there is! That’s why there’s no new cookie today. I am exhausted. Ooh! Is there a new resident in the CookieMadness household that we will soon get to see? They definitely look good. Pudding is something I haven’t tried in CCC. Argh. I just replied to all the comments individually and then accidentally deleted my response. I need to go to bed. I’ll look forward to hearing some reviews on this recipe. In my opinion, it’s better than the other one. The cookies are soft, but they have crispy edges (at least on day 1) and an interesting flavor. 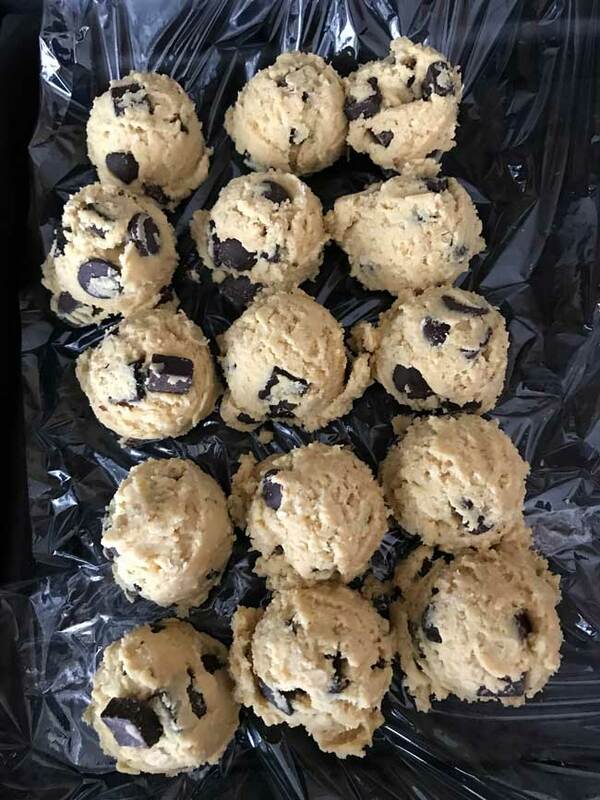 I can’t thank you enough for thinking of this new twist – I’ve tried the allrecipes recipe (Award-Winning Soft Chocolate Chip Cookies) a few times and always found it to be too cakey. I thought it was just me =). I will try these (and probably add walnuts or pecans) soon! 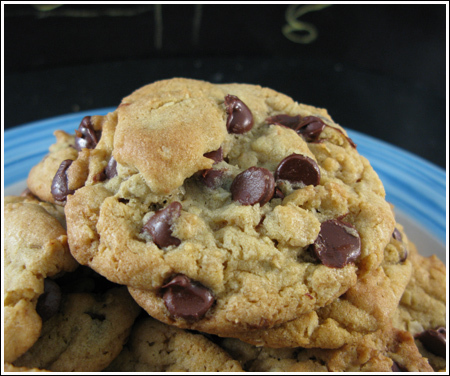 o and as for a name…how about chocolate chip cookies!! no more explanation needed!! something about that pudding…makes them SO delicious you wont go back to the regular kind!! Looks good! This lends itself to different varieties with different pudding flavors. I will have to try these. I have tried the other recipe from allrecipes you mention and did not like them at all. No one at work did. They were cakey and tasted artificial. I like the addition of oatmeal (maybe I will throw in some PB or use butterscotch pudding for an added depth of flavor). YUM! Mmmm..this sounds good. And an interesting twist on an old standby! This one’s going in my googlereader to be tried! They look so delicious! I would love one for dessert tonight! Looks good! Want to try these, you are right, seems weird that they aren’t cakey from the pudding mix. Love the big lump on top of the one in your picture and all the chips. Yum! No worries for posting later than usual -especially since you grace your loyal readers with another FABULOUS chocolate chip cookie recipe! Yum! Now, that looks like a cookie worth trying! Woops…I forgot to add that it is the addition of the pudding and the oatmeal. This is interesting to me as this is the Nestle Toll House recipe with the addition of the pudding…in order to get a chewy cookie at this altitude, I used one stick of butter for flavor and 1/2 C of shortening. I began using one C of brown sugar and a half C of white sugar, as well. They look gorgeous!